For a long time, I thought gaming chairs were made only for the pro gamers who spend countless hours practicing. I might not be a pro gamer but I get glued to a seat for several hours playing my favorite games – Fifa and COD. Not to mention that I also work from home, adding up to the hours I spend on my straight-backed chair (not anymore). After a while with this daily routine of mine, I developed issues with my back and neck. Not to mention the number of times I had to stand up for a stretch. This can really be a productivity drainer. A visit to my therapist and hours of research all recommended an ergonomic chair – gaming chair. That said, my new mission was to get the best gaming chair that will help me and to throw out my old one. It wasn’t an easy task but I came up with the perfect chair for me, the Herman Miller Embody Chair (Click here to see on Amazon). Its narrow back made moving in the chair really easy. Most importantly, its lumbar support always has my back. I mean that literally though. With comfort came fewer stretch breaks and more productive hours. It was definitely worth the price. I did my research and decided to ease you the stress of searching. This is why I’ve reviewed some of the better ones and put this guide together for you. Wonder why an office chair made the list? Here’s why. Designed with input from dozens of physicians, The Embody is one of the most ergonomically advanced chairs in the world. 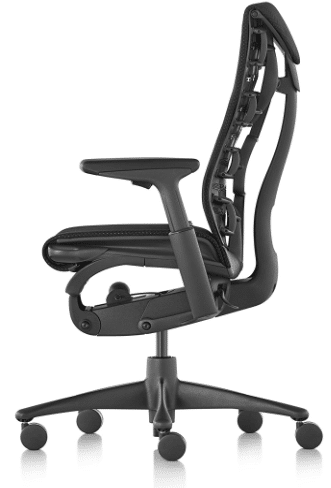 The adjustable backrest allows alignment with the unique curve of your spine. Its design makes you feel like you are floating and does even more when behind the best gaming laptop for hours. The layers of support and narrow backrest allow better flow of blood and oxygen which reduces fatigue and keeps you focused. Unlike leather chairs, it has great airflow that keeps you cool and comfortable even after extended periods. The Embody is my go-to chair even after almost 10 years its first release. I really cherish its ability to distribute weight once seated upon and still feel balanced. The backrest adjustability is remarkable. Since I got the correct adjustment, it has been 100% comfort all the way. This makes me more productive because I no longer have to stretch every half hour. The support remains constant even when in a reclined position. I really like the seat’s cool-feel as I don’t have to worry about having sweaty underpants. I am not a DIY person so I like that it comes assembled. The chair is worth its price and it relieved me of my back issues. The only issue I have is with the armrest. It doesn’t adjust back and forth and keeps bumping into my desk. This needs to be addressed for people who like sitting close to their desks like me. This luxurious gaming chair is the first real leather gaming chair in the world. It’s great for use in the gaming room or office due to its unique leather material and aesthetics. Built in an ergonomic shape that protects the natural shape of the back, it allows extended seating with comfort. The back and lumbar cushions add more comfort. Its sophisticated rocking mechanism allows the chair to be customized to personal requirements. 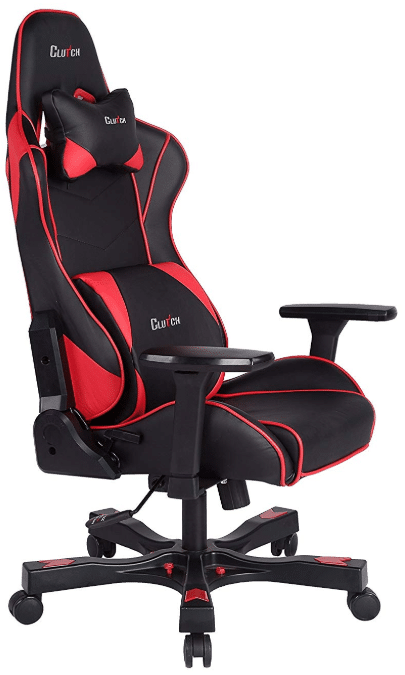 It is a durable gaming chair with upholstery that is resilient to wear. What I like the most about this chair is that it easily fits my 6’4 frame. My foot even leaves the floor when I adjust to the highest height. I really like the sensory appeal of its leather finish and stitching. It gives you a feeling you are immersed in an actual racing car seat. The Epic by Noblechairs has a very firm cushion thanks to its dense cold foam and of course, the lumbar and head pillows for added comfort. They come back to shape like they are renewed after each use. It’s also pretty easy to assemble and that’s for a non-DIY person like me. It took just 15 minutes to put together. Though it fits perfectly for someone my height, it might be too long for short people. The padding, which I really like, can be too hard for most people to sit on. Some say it feels like they are seating on wood. That said, the Epic real leather chair is of high-quality and it’s well worth the price of $340. It has a Class 4 Gas lift and supports a maximum load of 265lbs. SecretLab is a relatively new gaming chair company but their Titan gaming chair ensures you get off on the right foot with their products. The Titan is a “Titanic” at Secretlab being their largest gaming chair but definitely fit for a king. The Titan gaming chair is really great for extended hours at the key and easily supports larger users of up to 290 pounds. Its lumbar adjustment knob works like magic. All you have to do is to tilt the knob till the lumbar support suits you. Its headrest is made of extra soft velour that supports the head pretty good. The dense foam padding and thick PU leather is a great option if you prefer firm chairs. Thought the chair provides adequate lower back support, it will be much better with a lumbar support cushion. Its 70-pound frame of steel and aluminum easily supports larger users. 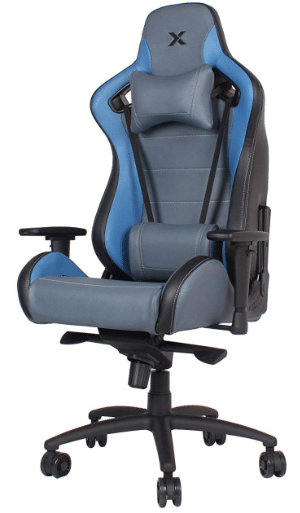 AKracing chairs are one of the world’s leaders in game chair manufacturing. It’s no surprise that gamers use their chairs in Twitch streams (such as Fortnite’s leader Ninja) and, and at major esports events. The Core Series Ex is a comfortable gaming chair made with a mesh-like fabric upholstery rather than PU leather. 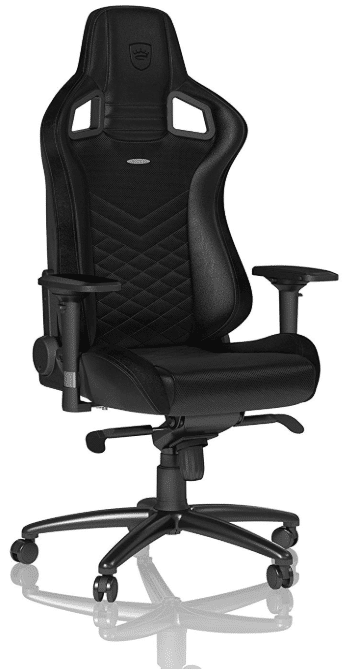 It also has an unrivaled backrest adjustability of up to 180° which makes it recline in an almost flat position. It’s designed to support larger users with its 330 lbs. weight capacity. The Core Ex-Wide supports a wider frame but with the same capacity. The usual saying is that what we pay for is what we get right? But with the Core Ex, I got way better than I paid for. For a chair that offers such great quality and comfort, it’s a very good purchase at less than $300. The 180° reclining option also lets me take a short nap in it! Not to mention the great cushion of the headrest and lumbar support pillows. Its upholstery is made of breathable fabric that’s suited for use in a warmer climate. It doesn’t mean it should be used under direct sunlight. The padding is focused only on areas that directly touch the body. The chair is comfortable but could do better with more foam padding. Strong steel build finished with anti-corrosive paint for longer use. The GT throne is one of the few gaming chairs with a special feature directly tuned into the games. 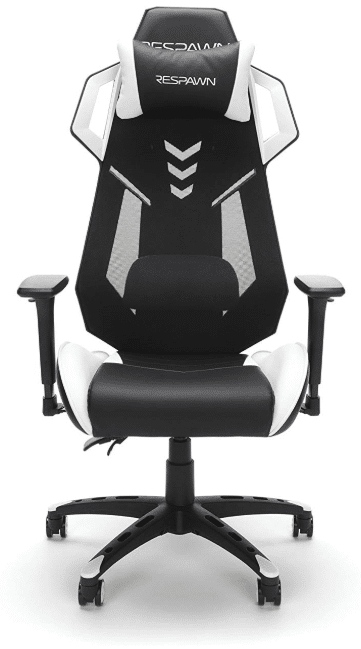 It is the only gaming chair that incorporates vibration into gameplay using Trevor FX technology. It’s pretty simple to work. 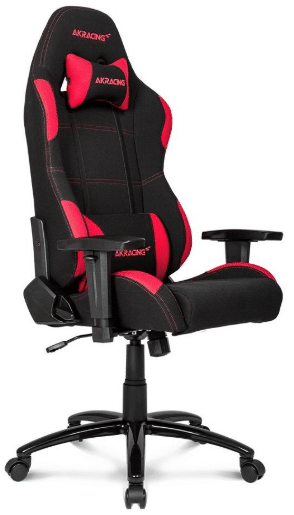 Once connected to the audio jack of a console, the chair vibrates to any sound effect in a video game giving you an immersive experience only found in simulator racing chairs. However, this doesn’t make it any less suitable for office use or non-gamers. The vibration feature doesn’t compromise comfort in any way as it still offers great ergonomic support and durable build. Just like you, I couldn’t wait to test the GT Throne’s vibration feature with my favorite game – COD. It was really remarkable as I felt very gunshot and explosion in my back and thighs. It works with any audio at all and not just video games. Of course, I tried a couple of my favorite tunes with it. Not to mention that its faux leather coupled with the head and lumbar cushions make it very comfortable to sit in for long hours. To give it a majestic touch, it has a long backrest that doesn’t leave my head sticking out of the chair. The vibration feature requires a cable to be connected to the receiver under the chair. This can get entangled with the caster wheels. This should be made wireless to prevent accidents or damage to the cable. It has flat, ergonomic armrests that can be raised or lowered to your requirements. 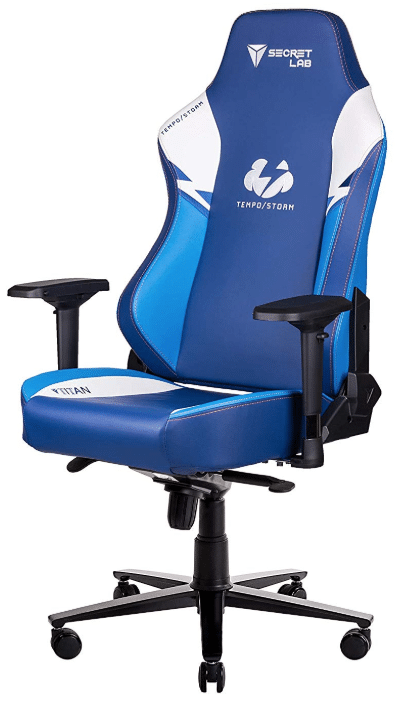 Vertagear is one of the big wigs in the gaming chair industry and that didn’t happen by chance. They are known for paying attention to the tiniest detail and only uses premium material to craft their products. The SL 4000 is another masterpiece by Vertagear. 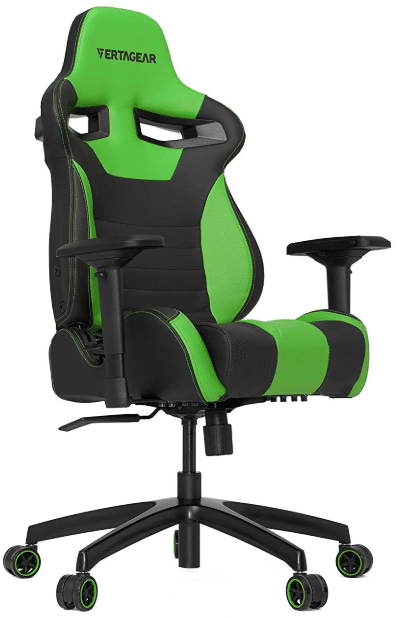 It offers unparalleled comfort and adjustability for gamers and those who seat long hours. The high backrest is specially designed to give relief to the head, back, and lumbar when seating for an extended period of time. The first thing I noticed that’s really caught my attention is the extra attention to aesthetics. It looks very much like a racing chair with its PVC leather and comes in many colors. Also, it has a headrest pillow made from memory foam which is a premium material that guarantees comfort. This makes it really comfortable to seat in. Unlike the Embody which is also my favorite chair, the SL 4000 has a 4-D armrest that adjusts in any direction. It’s also very easy to assemble and doesn’t need expert assistance. The chair isn’t really made for people with bigger build even though it is designed to support heavier people. Funny right? That’s what I thought too. A little bit of padding should also be added to its lumbar support. But it’s a really comfortable chair in general. “Slide-in” feature makes it easy for just one person to assemble. RapidX describes the Carbon Line as “Comfortable. Inspired. Adjustable” The Carbon Line is a durable chair modeled after a luxurious sports car. Inspired by positive feedback given to their extra-large gaming chairs, it is designed to seat larger gamers with its wide seat and a weight capacity of up to 350lbs. You can rest assured of optimum comfort regardless of your size. Like most gaming chairs on this list, it offers ample adjustment options. It can tilt from a slight forward angle of 85 degrees to an almost flat lean of 155 degrees with five locking positions. The first thing I noticed is how much better it looks than in the pictures. Its classy carbon fiber fabric makes it a great addition to your office or game station. That aside, the chair is really sturdy and it’s a must-have for tall people. I am 6’4 and I was able to sit and push my head on the backrest with about 2 inches left of spare. Its dense foam padding still makes it comfortable for long hours regardless of the extra weight. It’s the kind of thing you don’t just see around in regular gaming chairs. The only problem I see with this chair is that it’s not suitable for short or even people of average height. It is also pretty heavy weighing about 64 pounds. But it makes sense since it was designed to seat larger people. It has a wide and sturdy seat that supports a large person of up to 350 lbs. It has a dense foam padding and comes with head and lumbar pillows for extra comfort. DXRacer was formed in 2001 as a luxury car seat manufacturer and later crafted the first gaming chairs in 2006. 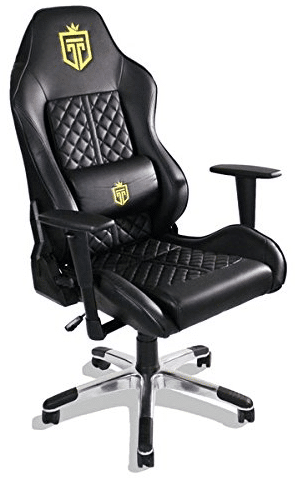 They have been making high-quality gaming chairs ever since with premium materials. Their gaming chairs are popular in the pro-gaming world and are used at major esports events. The OH/RV001 is a masterpiece in its price range for with an unmatched ergonomic design and sturdy build among its competitors. The chair has a large angle adjustor that makes it recline up to 135 degrees. I took a nap in it after an extended period using PC and still felt comfortable in it. It’s also great for stretching if you don’t want to take that short walk that might destabilize your concentration and productivity. Taking a short walk isn’t bad but with other cheap office chairs, you might just take too much of them. The chair seat is firm and gives decent back support. I’ll recommend this if you just need to be able to sit long hours. The PU leather is not all that thick and could definitely do better in that area. Also, the frame is only relatively padded in areas that directly hit the back, leaving open cavities under the fabric in other areas. It’s a functional chair but would be better with dense foam padding. Clutch is a budding gaming chair company and they are looking to build a reputation with their high-quality chairs. The Clutch shift series stretch your dollar the furthest with its high -quality build and awesome features. The chair is built with a tubular steel frame that makes it very durable. It even has a lifetime warranty to show for it. This vacuum is likewise outfitted with a totally fixed framework and a HEPA channel to trap residue and allergens. It additionally incorporates a Brush move Shutoff catch so you can without much of a stretch switch among cover and uncovered floor cleaning. The chair is very comfortable and I never wanted to get out of it after trying the “Zero Gravity” feature. To get the Zero Gravity effect, I simply pulled the tilt lever from under the seat and reclined it to about 135 degrees and locked it. Then it’s “Zero Gravity” time. The chair is doing all the seating for me as opposed to trying to balance my back in the chair. Regardless of overall comfort level, the lumbar pillow doesn’t offer much support. This needs to be made better for better back support. Its hulking steel frame and aluminum base is built to last for life. It comes with a lifetime warranty. You’ve gotta love the name of this one if you’re a FPS gamer… RESPAWN! The Respawn 200 is a more budget-friendly gaming chair that still guarantees comfort whether it’s used for intense gaming or long work hours. The mesh backing and leather cushion set it apart from its competitors. This makes the chair stay comfortable and cool after hours of intense gaming and movement on its seat. The chair is really comfortable and trains better posture. Its cushioning is meant to give relative comfort and nothing more. It doesn’t give room to cross legs or seat in a funny position. It’s a good choice if you aren’t too concerned about aesthetics. For a gaming chair weighing 50 lbs., it has a staggering weight capacity of up to 280 pounds. It has a lot of plastic components that make it look like a toy. It still offers a great build of quality, unlike other chairs that appear cheap. Its mesh back increases airflow to regulate body temperature. What Is The Benefit Of A Gaming Chair? Be that as it may, you should regularly get up for a walk even if you have the most comfortable chair. Most of us have to sit for prolonged hours to earn a living and this causes persistent back pain in the long run. If that’s the case, then sitting in an ergonomic chair is a priority. Gaming chairs are great ergonomic chairs. In that case, you should consider purchasing one. Above are the best gaming chairs that I have researched and personally made use of so you can buy a gaming chair that meets your needs. 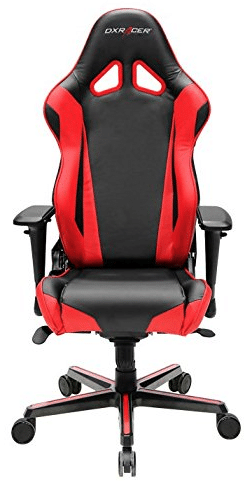 If you already have back issues, I suggest you purchase the #1 gaming chair as it gives you unrivaled back support and also stimulates price and oxygen flow in the body. It costs a fortune but your health is worth more than that right? If you don’t have any back issues, then you can select any of the other gaming chairs that meet your required needs. You can find the best budget-friendly gaming chair or one that supports a large body frame in this review. I hope you find a chair that suits you in this review.